A hurdle for many interested in learning how to watch TV without cable is picking the best streaming services for them. 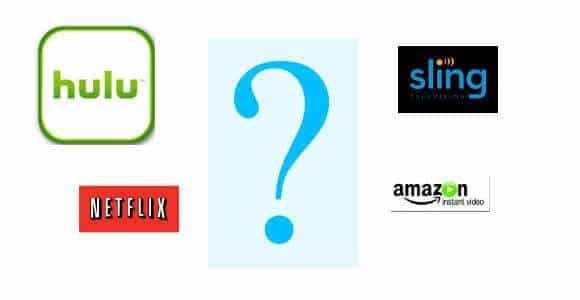 In this post I want to provide some examples of the types of potential cord cutters out there, and which streaming TV services will meet their needs. As TV tastes vary greatly from person to person, I won’t be able to describe every single TV viewer out there. However, I can describe some archetypes and price out the best streaming services to meet their needs. I’ll also describe potential gaps and how to address them. I’ll assume a $50 per month cost on internet service for each example. I also recommend an antenna for anyone with broadcast signals in their area. This is a free way to watch ABC, FOX, CBS, NBS, PBS and CW. The cost cutter enjoys watching TV, but is looking to make a huge savings by dropping their cable bill. The following streaming TV services provide more than enough content at a low monthly cost. Choose one of these for access to movies and past seasons of TV shows. Amazon Prime requires either a yearly subscription of $99.99 or $10.99 per month. Netflix, on the other hand, varies based on package. Their offerings are summarized in the table below. Personally I feel Amazon Prime is a better value as you also get free music, books, shipping, and photo storage with a Prime membership. You can try Amazon Prime free for 30 days to see if you agree. I recommend grabbing the 1 month trial to Amazon Prime while simultaneously subscribing to Netflix. This allows you to try both services side by side and drop the one you least prefer. Just make sure you decide before the month is up. Update: Amazon Prime now offers Showtime and Starz without cable. You can enjoy every show those networks have to offer without cable for just $8.99 per month, per network. Hulu will provide on demand access to current and past season of TV shows on ABC, Fox, CW, and NBC. While CBS has some shows available many current seasons are unavailable on Hulu. I personally don’t find this to be a problem as all their shows are available on CBS.com. Hulu provides tons of other great shows like South Park, The Daily Show, and The League. They also have original content you can only see on Hulu. There service is month to month with no contract so you can try it and cancel anytime. For more information check out my full review of Hulu. What About Must-See Cable Shows? The cost cutter may want to keep up with the current seasons of shows available on cable networks like AMC, A&E, and TNT. Many of these shows are available on Sling TV albeit at a cost of $25 a month. You can take Sling TV for a test as they are currently offering a 7 day free trail. Alternatively, you may want to experiment with season passes of shows from iTunes or Amazon Instant Videos. Episodes of current cable TV network shows are available for streaming 1 day after an episode airs. The season pass price varies from show to show, but I find them quite affordable. For instance, my wife and I watch the current seasons of “The Walking Dead” and “Better Call Saul” which cost $26.99 and $16.99 respectively. That breaks down to a monthly cost of $3.67 per month. I also have access to watch the shows whenever I want and as many times as I want. The shows are yours indefinitely. This article on how to watch cable TV online will give you an idea of some of the shows available. Of course the more “must watch” shows, the higher the monthly cost will be. If you are coming close to $25 a month you may want to go with Sling TV. To give you an idea, purchasing season passes of 5 current series will cost around $11 per month. This TV Streaming Service Package starts at $66.25 per month for tons of TV content and Internet service. It also provides the flexibility of purchasing must watch seasons of shows not available on the Netflix, Amazon, or Hulu. That cost is what you make it, but 5 full seasons of hit shows per year should only bring the costs up to about $77 per month. That’s a great value considering your monthly cable bill would be around $130 per month for a similar experience. The “make it like cable” wants as much content as possible and a lower cable bill. While this person won’t save as much as the “cost cutter”, they will soon realize its better deal cutting the cord than staying with cable. This package will follow all the advice given to the “cost cutter”, but we will be adding Sling TV and possibly HBO Now. Sling TV will provide ESPN, ESPN2, ESPN3, TBS, TNT, AMC, CNN, Food Network, Cartoon Network, ABC Family, A&E, History Channel, Disney Channel and much more for $25 per Month. That’s a great value considering that those are the most watched cable TV networks. This is an optional add on. If you want HBO, then it’s going to be available to cord cutters in April 2015. For the first three months the only device HBO Now will be available on is Apple TV. After that period, the exclusivity ends and other devices will be able negotiate to make the HBO Now service available. The Service is priced at $14.99 per month. Sling TV will be the first and only Internet TV service to offer live HBO and ESPN. . . Best of all, we’ll be up and running in time for one of the most important TV moments of the year: the April 12 season premiere of Game of Thrones. Read my full review of Sling TV for more information on what Sling TV has to offer. All that content with High Speed internet will cost 106.23 per month. I had HBO with a mid-tier cable TV package before cutting the cord and was paying $150 per month. This is more content than I personally need, but I can’t deny it’s a great value compared to cable TV. The beauty of this package is you are still saving money compared to cable TV and you aren’t stuck in a contract. You can drop services to slim down the bill, or add season passes to the shows you are missing (although I don’t see you missing much with this package). It’s going to be tough to nail down one price for this cord cutter as taste in sports varies greatly from one person to the next. However, I can show what the most expensive sports streaming will cost and you can simply subtract the services you do not need. Sling TV will provide Access to ESPN and ESPN2. It will also provide a whole host of cable TV networks like TBS, AMC, and many more. You can also purchase the Sports add-on package for $5 per month. The Sports package bundles the SEC Network, ESPNEWS, ESPNU, Universal Sports, Univision Deportes and beIN Sports. For those that can’t get enough NHL action, NHL GameCenter Live lets you watch every NHL game from every team live for $99.95 per year. There is a delay to games that fall under blackout restrictions. For more details, check out my article on How to Watch NHL without Cable. NBA Fans can watch every game from every team with Choice NBA League Pass for $125.00 per year. Once again, there is a delay for games that fall under league blackout rule. I give an overview of the service in my post on How to Watch NBA without Cable. Watching your home team and Sunday Night football is easy enough. You can simply use your antenna as the NFL broadcasts all games for free in each team’s home market. Monday night football can be seen on ESPN with Sling TV. Watching NFL action outside of your home market can be a bit more problematic. If you meet certain requirements, you can purchase NFL Sunday Ticket without subscribing to Direct TV. Otherwise NFL Game Rewind is your only option to watch NFL games without cable. NFL Game Rewind allows you to watch all NFL Games on a delay for $69.99 per year. The delay is between 8 and 24 hours depending on the time that the game aired. Internet and the ability to watch almost every game from the 4 major US sports will break down to a cost of 108.75 a month. Netflix and Hulu will bring the costs up to $125 per month. I can’t image what all that would cost through a cable TV subscription. This will give you an idea of what different types of cord cutting packages will cost. If you want to experiment with the costs of different services and compare it to the cost of your current monthly cable bill, you can take a look at my Cord Cutting Calculator. Suggestions are welcome in the comments. If you like the content published at Grounded Reason, please subscribe and new content will be sent to your mailbox as soon as it’s published. You can also follow us on social media. Just scroll up and look to the right.